The Chinese and the Koreans have been using ginseng for centuries to treat all kinds of illnesses. It is called “The Plant of Vitality” because of its amazing ability to promote vigor, stamina and vitality. If you are feeling weak, unhealthy and frail, Fharmonat Ginseng is the key for you to experience great improvements in your health and wellness. This amazing herb works by improving the flow of blood to all the different parts of your system – most especially to the brain and the reproductive organs. Increased blood flow to the brain results in sharper thinking, improved concentration and enhanced learning ability. If you are a student trying to excel in your exams, or a worker who needs to stay sharp and alert all day, ginseng can really be a trusty ally. Ginseng improves the body's utilization of oxygen, boosts stamina and helps relieve both physical and mental stress. It also removes toxins and cleans up your blood stream to keep your body free from harmful substances that can cause sickness and illness. 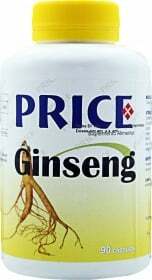 For those who have low sexual desire, ginseng is the perfect aphrodisiac. You can take Fharmonat Ginseng in capsule, single-serving vials or in syrup form. Sharper mental function, stronger immune health, better sexual performance and long-term vitality – all of these are yours as long as you have Fharmonat Ginseng by your side. Have a question about Ginseng? What is it, what does it do, how and when to use or something else? Ask us. Take 1 capsule, twice a day. WARNINGS Ginseng : Do not exceed recommended daily dosage! Food supplements should not be used as a substitute for a varied and balanced diet. Do not use if pregnant or nursing. Keep away from direct sunlight. Store at a temperature not exceeding 25°C in cool dry place away from sunlight. Keep away from children.